It was during Thanksgiving dinner preparation, my SIL reminded me of the 10 lb box of sweet potatoes sitting untouched. We were averted from the sweet potatoes as there was no room in the oven to bake any more items and we were running out of time before dinner. So we ended up with a whole box of sweet potatoes which we thought to bake sweet potato fries later. My Mom suggested making a stir fry instead. The outcome was really a refreshing stir fry with the blend of sweetness and heat. I loved the color combination of this dish. It sure enhanced the holiday mood for us too. I think it is apt to post the recipe now as orange and green can also go for Christmas season in lieu of traditional green and red combo. I soaked the cut sweet potatoes in water to eliminate some starch. You can skip that step if you don't have time. Soak the cut sweet potatoes for half hour and rinse and discard the water and keep it aside to drain excess water. Take a cast iron pan or non-stick pan and add 2 tsp of oil and mustard seeds to it. Wait till the mustard seed splutters, be careful if you are not used to this step. Add the 1/4 sliced onions, 2 split green chili and turmeric powder to it and cook covered on medium heat for 2 minutes. Add the cut beans, salt and cover and cook till the beans are tender, approximately 7 - 8 minutes. Use the same pan and add 1 tbsp of oil and crushed garlic to it. Roast the garlic till golden brown. Add the sliced onions and cook for 1 minute. Add sweet potatoes, pepper powder, chili flakes and salt and cook covered on medium heat for 10 minutes. Stir occasionally and add curry leaves to it. Remove the lid and increase the heat slightly and cook for couple more minutes or till the sweet potatoes looks little crispy or lightly browned. Transfer to the same dish with green beans and mix them together. 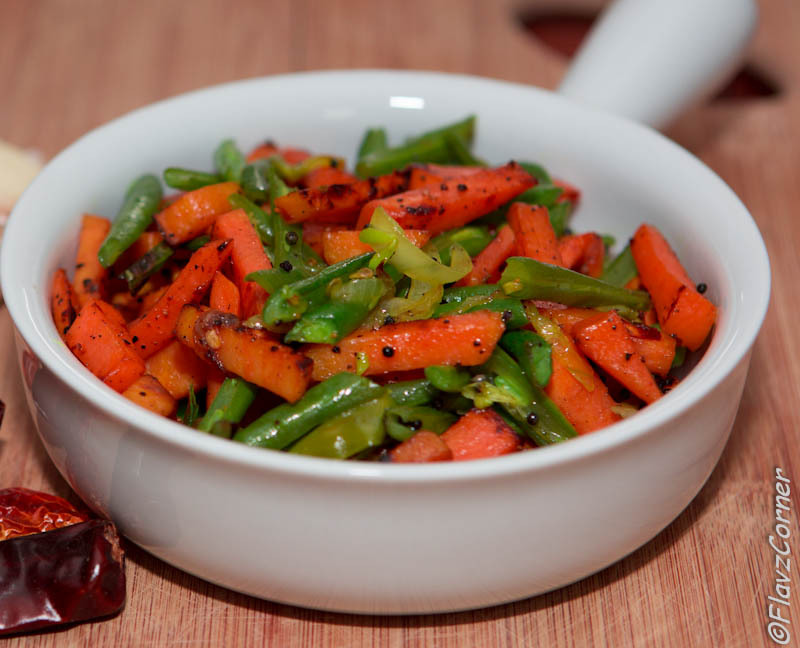 Stir fry is ready to be served with rice or roti (Indian flat bread). Wow! This recipe is great! I'm exactly looking for a healthy dish that I can cook for my breakfast next week. 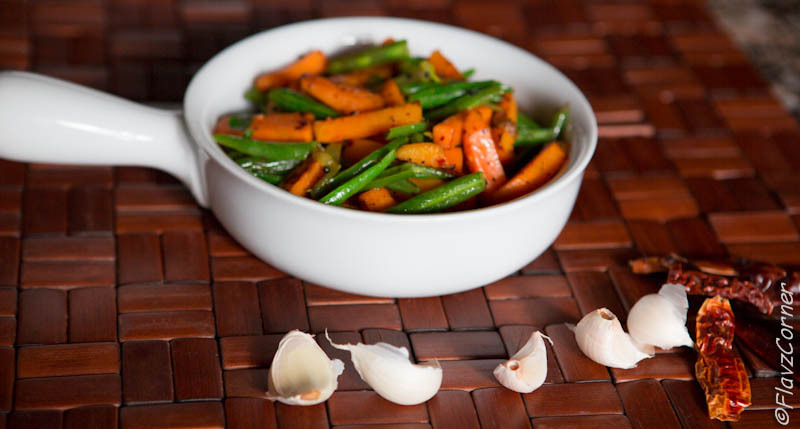 And I think this recipe is suited to my taste, because I really love eating green beans and sweet potatoes! I will definitely try this.